The anniversary, on Sunday 18 June 2017, was marked by the performance of a double bill about the bridge which I devised and directed for the STR at the Bridewell Hall, just off Fleet Street. 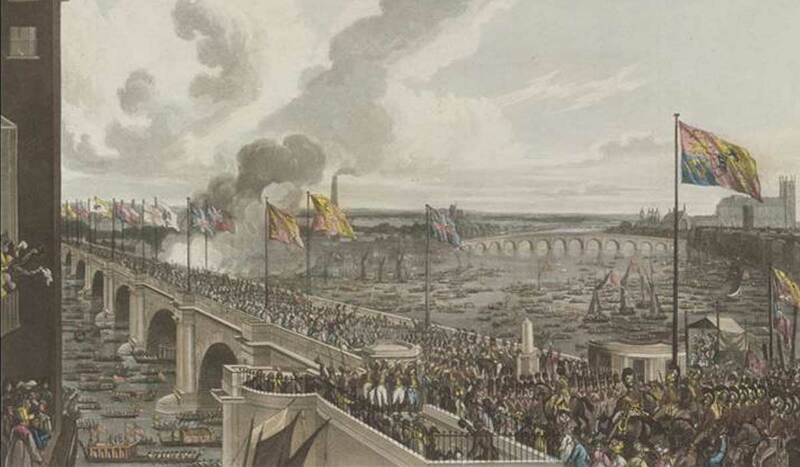 The first part consisted of my dramatisation of a description of night life on the bridge by the nineteenth century journalist James Greenwood and the second a production of Richard Brinsley Peake’s first recorded play, The Bridge that Carries us Safe Over, which was originally performed at the Lyceum Theatre on the day of the bridge opening, 18 June 1817. Peake is best remembered today as the original adaptor of Frankenstein for the stage. I had come across his “dramatick sketch” as a result of my researches into Peake for a paper which I gave at the STR’s Regency conference in 2016. It is a slight but amusing satire on the efforts of an incompetent playwright to persuade the Lyceum management to mount a production of his play about the opening of the bridge. The play turns out to be an overblown disaster and the playwright is thrown out of the theatre. The Lyceum then shows a panorama of the bridge opening with vocal tributes to the Duke of Wellington. I felt that the anniversary should be celebrated by a revival and the STR Committee agreed. It was however fairly short and I looked for a companion piece. When I came across Greenwood’s moving description of his encounters with the down and outs, drunks and prostitutes who frequented the bridge for shelter, entitled A Night on Waterloo Bridge I felt it was well suited to a stage adaptation. Having traced one of the original songs from Peake’s play, I also found a variety of other music to accompany both pieces. I was lucky enough to be supported by two professional musicians, the pianist Yvonne Behar, who devised the accompaniments and background music, and the music theatre singer, actor and saxophonist Sarah Mahoney. Their performances added immeasurably to the audience’s enjoyment. The rest of the cast were members of the Questors Theatre and work colleagues. We were also very grateful for the rehearsal space organised by Dr. Valerie Lucas and to the administrators at 3PB Barristers who printed the programme. On one of the hottest days of the year we were thankful that the Bridewell Hall had air conditioning and also provided cold drinks. Those members of the Committee who were able to attend and many others in the audience appear to have had a thoroughly enjoyable time. The occasion brought to life a minor but most amusing historic rarity. I am now planning a rehearsed reading of Peake’s original stage adaptation of Frankenstein. Details will follow.